Kichler Lighting 5907FST Frosted 40W 120V T-3 Candelabra Based Krypton Lamp is suitable for use with all Kichler lights requiring a T-3 Candelabra base with a 40W (maximum wattage) required lamp. Krypton lamps create sparkling white light by eliminating yellow dullness and provide a higher lumen output at a lower wattage. 5907FST is more efficient, has a longer lamp life lasting an average of 3,000 hours and is easily dimmable with a quality standard incandescent dimmer. The primary design benefit of the Krypton lamp originates with the Krypton and xenon gas mixture employed to fill the lamp. 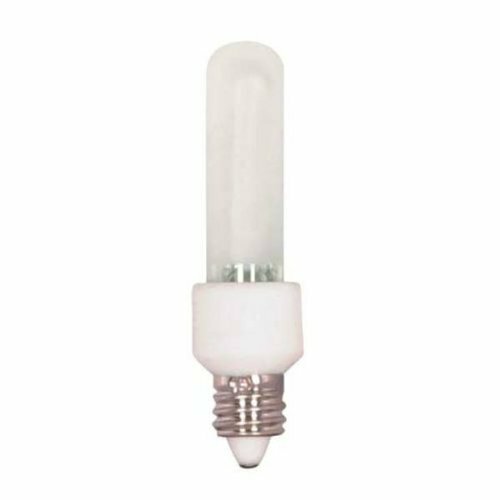 The inert gas blend provides extended life over comparable halogen lamps, less bulb wall heat for easier handling and a similar color temperature of approximately 3100K. Krypton gas possesses a heavier molecular structure and a higher atomic weight than the standard argon gas, thus insuring slower circulation and heat transmission resulting in slower tungsten filament evaporation. Slower filament evaporation results in reduced blackening of the lamp walls and a higher maintained lumen output. 5907FST comes one per package. Since 1938, Kichler Lighting has offered a distinctive array of lighting solutions that reflect your individual personality, tastes and plans. Kichler brings you an unparalleled variety of exciting style families, unique finishes, fresh colors and unequaled quality. Whether its casual, contemporary, transitional or traditional, you'll find it with Kichler, lighting that defines your style.